As Iran enriches up to 19.75 percent in the PFEP, it is important to understand Iran’s potential to enrich greater quantities of 19.75 percent enriched uranium by using more cascades. As the original agreement to swap LEU for 19.75 percent LEU had an eye towards both removing most of Iran’s stock of 3.5 percent LEU and preventing enrichment up to 19.75%, a future renegotiated deal will also need to take into account the removal of Iran’s growing stock of 19.75 percent LEU and verified commitments not to produce more. One of the serious weaknesses in the Iran, Brazil, and Turkey declaration on the removal of LEU from Iran is its silence on these critical points. The table below illustrates different scenarios for Iran’s production of 19.75 percent enriched uranium at the PFEP based on the number of cascades enriching, Iran’s experience to date, and its stated goals. It is important to note that Iran’s enrichment of uranium to this level is still in its early days. The recent two to three month period reported in the May 31 IAEA report does not establish a firm record of enrichment output. Nonetheless, it shows that Iran was able to quickly produce this higher enriched material in significant quantities. Iran has also demonstrated its ability to disassemble, move, and restart cascades as needed. Iran is also becoming more sophisticated in operating centrifuge cascades together to produce higher levels of enrichment. As a result, Iran has accomplished additional steps in demonstrating a capability to make weapon-grade uranium either in a parallel secret program or during a breakout. The Natanz PFEP is configured to hold six 164-centrifuge cascades in total. Iran uses one of these cascade bays to test several more advanced types of centrifuges configured in 10, 20 and single unit cascades for R&D purposes. When Iran started making 19.75 percent enriched uranium, the PFEP held only one 164-centrifuge cascade, called cascade 1. 2 It has now reinstalled a second cascade, called cascade 6, also designated for production of LEU enriched up to 20 percent. As of late May, cascade 6 had been prepared for enrichment but was not enriching pending the application of more sophisticated safeguards arrangements. Iran informed the IAEA that it planned to connect the two cascades, feeding the waste stream, or tails, of the first one into the second one. The first cascade’s tails of about 2 percent are to be fed into cascade 6, reducing the tails to 0.7 percent, or natural uranium. The IAEA did not state the enrichment level of the product of cascade 6. The product is unlikely to be enriched to 19.75 percent, but it would likely be higher than 3.5 percent. If Iran chose to expand enrichment beyond the two cascades it currently uses, it has three additional slots to use. Iran also has the option of expanding into the Fuel Enrichment Plant (FEP) if it seeks to produce the 20 percent LEU even faster. Between February 9 and May 21, 2010, Iran introduced a total of 172 kg of low enriched UF6. On April 7, after 57 days, Iran withdrew 5.7 kg of 19.75 percent LEU uranium hexafluoride from the PFEP cold traps and stored it in a small cylinder. 3 Iran notified the IAEA it would soon remove more 19.75 percent LEU in the cold traps. Based on Iran’s estimates, Iran initially produced 19.75 percent LEU at a rate of 3 kilograms per month. 4 Using this rate to estimate total production to date, Iran is estimated to have accumulated about 11 kilograms of 19.75 percent LEU through the end of May. Using the Iranian figures of 5.7 kilograms of 19.75 percent LEU, a 3.5 percent feed assay, and a 2 percent tails assay, the total annualized enrichment output, measured in separative work units (swu) per year, is almost 120 swu per year. The average for each centrifuge in the 164 machine cascade at the PFEP is 0.73 swu per year per centrifuge, slightly lower than the average recently achieved in the Fuel Enrichment Plant, about 0.9 swu per year per machine. 5 Achieving a rate of 5 kilograms of 19.75 percent LEU, while keeping the tails assay the same, would require an average of 1.2 swu per year per centrifuge. Based on the experience at the FEP, a more realistic estimate for production in one cascade 25-50 kilograms per year of 19.75 percent LEU, or about 2.1-4.2 kilograms per month, where the tails assay is fixed at 2 percent. 6 This value reflects reliability problems similar to those encountered at the FEP and is more conservative than Iran’s goal of 3-5 kilograms per month. If lower values incorporating major reliability problems are assumed, as has occurred at the FEP in the past, then the production rate of 19.75 percent LEU could fall to 1.25-2.9 kilograms per month, which was the original rate estimated by ISIS in the fall of 2009. Based on Iran’s recent operating experience at the PFEP, however, this range appears too low. How quickly Iran might produce 19.75 percent enriched uranium will depend on whether it uses only one cascade or decides to use more cascades at the PFEP. Although Iran has said that it will expand the enrichment effort beyond a single cascade, it has not revealed the enrichment level of the product of the second cascade. Table 1 illustrates how quickly the addition of cascades increases the total rate of production of 19.75 percent LEU. 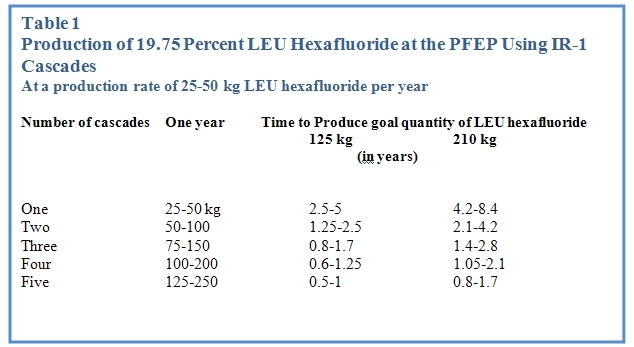 Table 1 is an estimate of 19.75% LEU hexafluoride production capability at the PFEP based on ISIS’s assessment of centrifuge operation at the Fuel Enrichment Plant, where monthly production capability is estimated at 25-50 kilograms of 19.75 percent LEU per year. Two key indicators in the table are the amount of 19.75 percent LEU hexafluoride produced in a year and the time to produce sufficient 19.75 percent LEU hexafluoride to further enrich and have enough for a nuclear weapon, taken here taken as 18-30 kilograms (uranium mass only) of weapon-grade uranium. 7 Selecting a final tails assay of 0.7 percent, as Iran implies, these quantities of weapon-grade uranium would require about 125-210 kilograms of 19.75 percent LEU as feedstock. As can be seen, if Iran installs more cascades at the PFEP, it can speed up its production of 19.75 percent LEU. Nonetheless, table 1 shows that one or two cascades would require several years to have enough 19.75 percent LEU to then further enrich and have sufficient weapon-grade uranium for a nuclear weapon. If Iran deploys five cascades it would produce this material in 0.5-1.7 years. Iran’s use of the PFEP to make 19.75 percent LEU limits its ability to produce this material. It could have used a module in the FEP, which contains 18 cascades, to rapidly make 19.75 percent LEU. In that sense, the use of the PFEP could show restraint on its part. On the other hand, Iran may not have been prepared to use the FEP, which has encountered operational problems, for such an important step. Iran may also have wanted to ensure its ability to continue to make 3.5 percent LEU at the FEP at a given rate while concurrently enriching up to 19.75 percent LEU. In addition, Iran may have sought only to learn more about enriching to higher levels, and the operation of one or two cascades would be sufficient to do that. Iran has not stated how much 19.75 percent LEU it plans to produce or, for that matter, how many cascades it will ultimately devote to the production of this material. Because further enriching from 20 percent enriched uranium to 90 percent material is quick and involves relatively few centrifuges, the UN Security Council is right to insist that Iran cease further enrichment at both the PFEP and the FEP. Iran’s recent actions illustrate how and why centrifuge programs pose such serious proliferation challenges, particularly in countries that refuse to cooperate with the IAEA’s requests for information and access to sites. As long as Iran maintains its centrifuge capability, it can incrementally strengthen its nuclear weapons capabilities under the guise of “peaceful” declarations, and shorten the time needed to make enough weapon-grade uranium for a nuclear weapon. 1 Technical Note: Annual Future Low-Enriched Uranium Fuel Requirements for the Tehran Research Reactor, David Albright, ISIS, October 7, 2009: http://www.isisnucleariran.org/assets/pdf/Tehran_reactor_note_7Oct2009.pdf 2 Several years ago, two slots housed 164-centrifuge cascades, but Iran subsequently disassembled one of them. 3 Using non-destructive measurements, the IAEA determined an enrichment level of 19.3 percent, close to Iran’s declared figure of 19.7. 4 The rate is about 0.1 kilogram per day. 5 IAEA Iran Report: Enrichment Increases Slightly; Lack of Adequate Safeguards, David Albright and Jacqueline Shire, ISIS, May 31, 2010: http://isis-online.org/isis-reports/detail/iaea-iran-report-enrichment-increases-slightly-lack-of-adequate-safeguards/ 6 This rate of LEU production corresponds to about 82-164 swu per year for the cascade, or an average of 0.5-1,0 swu per year per centrifuge. Iran’s range would correspond to about 115-200 swu per year per cascade, or 0.7-1.2 swu per year per centrifuge. 7 Each weapon is assumed to need 15-25 kilograms of weapon-grade uranium with the rest becoming scrap during manufacture of weapons components.